How much do you know about your great grandfather or another member of the family in his generation ? Or, if he was recently alive, somebody in the previous generation ? Family history is about much more than dates and places of birth, baptism, marriage and death, it is about their and their family’s lives, what they did at work, their interests, the history of the period in which they lived and so on. However, unless yours is one of the few families that kept meticulous journals, you probably won’t know much about them. I’m giving the Society’s next talk on March 24th. This talk is being held in the Volunteer Hall, St John St, Galashiels, so that we can have internet access for me to demonstrate the use of websites for my talk. Even for those that are experienced users, I hope to show things you haven’t previously considered. I want to encourage you to broaden your family history research so I’m going to demonstrate some search techniques and show some useful free websites, drawing upon my family tree. My family tree seems to have so many 'brick walls' that I have reason to hope that I can help you overcome some of yours. There is another reason for coming along and that is to see an exhibition of photographs that will help people date their own photographs. This exhibition is based on a collection of 19th century photos donated to the society by Douglas Bain and collated and researched by Ian and Morag Carter. If you need advice about any aspect of your family history, please do ask. 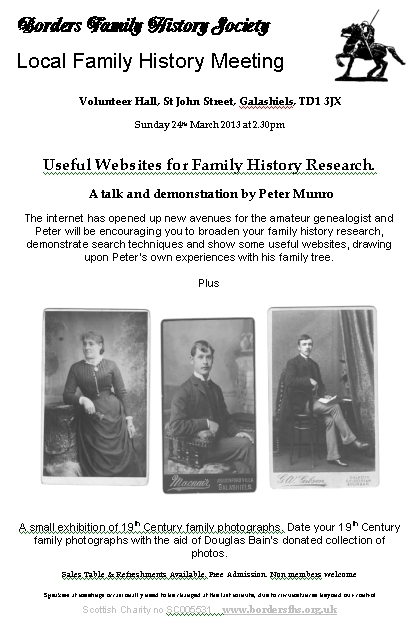 Admission is free and we’ll have usual sales tables and refreshments (donations welcome) after the talk. I hope to see you there. Map. As always, there’s a remote possibility that the speaker will need to be changed at the last minute. Where possible, we’ll put changes on our What’s On programme.